The trip to RIAT 2005 was organised by CI Martin McCloy, which involved a 5am start on Sunday 17th July 2005 from 215 HQ. The early start paid dividends though, with the full party inside RIAT by 8am the same day. 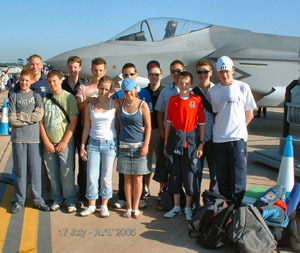 This years trip to RIAT (Royal International Air Tattoo) at RAF Fairford, was originally organised around the Friday Youth Day, as in 2003 & 2004, but this was cancelled due to lack of funding. 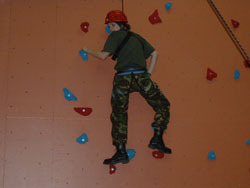 The only alternative left was to run a trip on Sunday 17 th as I was already attending on the Saturday with my family. The CO arranged for Wing HQ to hire a 17 seat minibus for us. There was a charge of £5 each for the outing. We had eight cadets from 215, ICWO B Garnham and Cadets Brannigan, Vanstone, Jones A, Howells, Evans J, Prosser and Sanders and five from 1358 (Brynaman) Sqn, CWO Adamiec, F/Sgt Rosser, Sgt Thomas, Cpl Davies N and Cadet Jones K. The CO had also given my friend, Graham Fisher (ex RAF) permission to join the trip, as he is interested in becoming a CI with Llanelli Sqn. 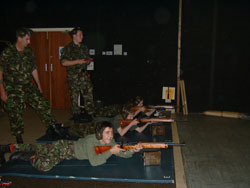 Unfortunately the cost to over 16's on the day is £35 pounds, RIAT Youth Days are free to all. By the way, under 16's and car parking is free. Not bad considering all profit goes to charities. All had agreed to be at the Morfa TA Centre by 05.00 on the day YES 0500!! By the time I arrived, most were there, and we had to wait until 0510 for the last Cadet. Not bad really. The reason for such an early start is years of my own experiences going to RIAT. All you need to do is note the Airfield opening time on the day, 0730, and take off at least 2.5 hours if leaving from Swansea. This will give you a fighting chance of missing the inevitable annual traffic tailbacks. One year I advised a friend of this, but he decided to leave Swansea at 06.30 and finally got on to the airfield at 13.30! We followed one of the designated RIAT traffic routes and got to the site at approx. 0755 after stopping at the last Services on the M4 for a short break. We were quickly parked up and heading for the Blue entrance onto Fairford. This year security was slightly tighter due to the recent London atrocity. The sequence was, hand held scanning with all metal objects held away from the body, front and back, visual search of all bags etc, ticket check, programme sellers and finally onto the airfield. We all assembled at the JSF mock-up for a "Team" photo. I had advised all to bring plenty of drinks, sun cream, etc as the forecast was for a very hot day with little cloud cover. The weather forecasters got it bang on! I had visions of my charges dropping like flies from sunstroke. Glad to say this did not happen. There was a small sun cover tent available to dump their bags, but all wanted to disappear to the four winds within seconds of the click of the shutter on my camera. Typical ATC cadets don't you think? Fair enough, I headed for a reasonable pitch with my friend Graham. We set up and took turns in leaving to look at particular show items that caught our eye. I will not go into details of the show itself as the website is excellent and, as ever, the web report is well worth a browse. I personally enjoyed the Il Frecce Tricolore (The Three Coloured Arrows), the Red Arrows, RAF 29 R Sqn Eurofighter Typhoon, Finnish Airforce F-18C Hornet, talking with the aircrew by their aircraft and photographing millions of pounds/dollars of military hardware to my hearts content. Some of the senior cadets found me later on and used the shelter as a refuge from the heat/sun, taking it in turns to cool down and have a break. The flying display ran from 1000 - 1800 non stop, so we had arranged to meet back at the JSF between 1830 and 1900. The Frecce Tricolore ended the flying display in superb form, we de-camped and strolled back to the rendezvous, all were waiting, bar one who hove into view after a couple of mobile phone messages. 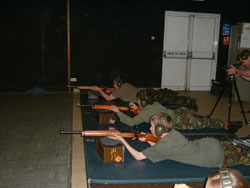 All had really enjoyed themselves and gave me no trouble at all. Some of the younger 215 Cadets had been speaking with aircrew, and also managed to get plenty of "gizzits" from the various displays and organisations present. No one seemed to be burnt either. 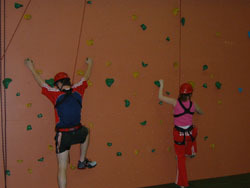 Everyone expressed their enjoyment of the day, which is what it's all about for any member of Staff. The fact that I am "mad" on Aircraft/Aerospace myself, is a nice bonus. We back tracked the morning route, but I missed a turning so we ended up heading for the M4 on a dual carriageway that turned to gridlock after about 2 miles. Luckily I managed to do a U turn, returned to the correct road and drove back towards the M4 where we had got off earlier. We had another detour due to a closed road, but this only added a few miles. Shortly after getting back on the M4, we stopped at the Services for a quick R & R break. Mainly getting drinks after such a long day on the sweltering grass/concrete. The drive back to Swansea was uneventful, arriving at approx 22.00. The Cadets had made sure the minibus was presentable to return to the hire company and then said their farewells. All again expressed their enjoyment of a grand day out and now realised why I had insisted on such an early start. We are all now looking forward to RIAT 2006 on the 14/15/16 July. There is no mention of a Youth Day yet. Fingers crossed. 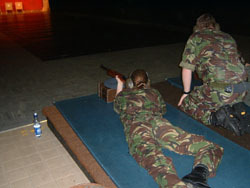 Mark 8 Weapons Handling Test and Qualification with WO Steve Hill and CI Martin McCloy. 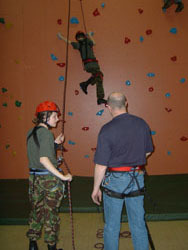 Climbing activties with Sgt Paul Brannigan, CI Melanie Russ and IFS Daniel Conboy. 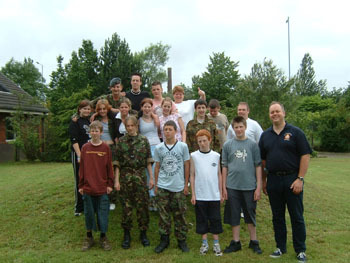 Pilot Officer Heath Davies with his fourteen Cadets, who thoroughly enjoyed their days activities at 215 Squadron.